Most of us have heard the story of how little Berwick-upon-Tweed remained at war with mighty Russia way after the Crimean War peace treaty was signed in 1856. In case you are blissfully unaware, it goes something like this…. Because of Berwick’s tendency to change hands between England and Scotland, old-time proclamations often referred to “England, Scotland and the town of Berwick-upon-Tweed”. Such was the case when the official declaration of war was made against Russia in 1853, when Queen Victoria supposedly signed herself as “Victoria, Queen of Great Britain, Ireland, Berwick-upon-Tweed and all British Dominions”. Though the war was wrapped up in 1856, the Treaty of Paris failed to include the “Berwick-upon-Tweed” bit, seemingly leaving the little border town at war with a substantial world power. Investigations in the 1970s, however, revealed that Berwick was not named in either proclamation, and that the yarn had been spun by a lecturing vicar in the early twentieth century who hadn’t done his research properly. As it happens, the Wales and Berwick Act of 1746 had quite clearly stipulated that all references to England in matters relating to law should include Wales and Berwick – so the doubts about the 1853 or 1856 utterances were irrelevant. To ease all doubts, a Soviet official visited the Mayor of Berwick, Robert Knox, in 1966 to effect a peace treaty, ‘just in case’. It was at this meeting that Knox uttered the famous words: “Please tell the Russian people that they can sleep peacefully in their beds.” Unfortunately, Mayor Knox almost certainly exceeded his powers when signing the agreement, thus invalidating the belated ‘peace treaty’ – and any official paperwork concerning the meeting has been lost. This all raises the question of whether other similar ‘conflicts’ have remained unresolved for lengthy periods of time. 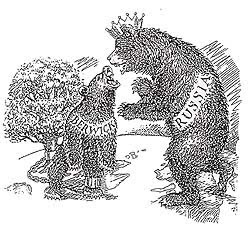 Wikipedia’s snappily-titled ‘List of Wars Extended by Diplomatic Irregularity’ gives a few interesting examples, including the incredible fact that the Second World War between the Allies and Germany did not technically end until the latter’s unification after the fall of the Berlin Wall in 1989-90. It was all to do with the fact that the Potsdam Agreement of 1945 concerning the governance of Germany couldn’t be properly and absolutely imposed until the nation was recognisably re-united. Consequently, the state of war persisted until the signing of the ‘Treaty on the Final Settlement with Respect to Germany’ on 12th September 1990.